Thinking of buying your kids a dog?? First get a prototype! Sounds weird, bit is actually not. Many of us love to have pets especially dogs, but with busy schedule and irregular routine it becomes almost impossible for us to have one. They need time, care and proper routine. Plus the added expense of having a dog is too much. We even have to take them for a walk! What we got a way to have a dog with all the plus points minus the negative? Well, we now sure do with the aid of technology. Robotics has taken a huge leap by providing the i-SODOG, your pet robotic dog. 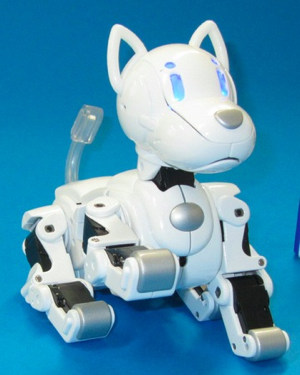 Japanese toymaker Takara Tomy has revealed a 4×6-inch, ¥31,500/$400, robot dog called I-SODOG weighing 400 grams. More than a toy, the dog can dance to music and even act as your personal bodyguard – putting the dog on your diary will cause it to bark when others try to read the contents. Takara Tomy’s i-SODOG might not be as intimidating as other robotic quadrupeds, but it sure is a charmer. 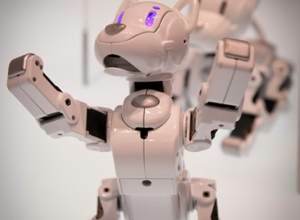 Freshly unveiled at the Tokyo International Toy Show, the puppy comes laden with touch sensors, 15 custom servos and a microphone, letting its master command it with up to 50 unique voice cues. The mechanical mutt’s mind packs some basic artificial intelligence as well, allowing it to learn and modify its behavior based on the user’s commands. If the pup flunks out of digital dog training, however, its owner can always assume control directly with the i-SODOG iOS / Android app or from a dedicated controller. It is classically versatile and easy to handle. Now your pet wishes are going to come true with no burden on you howsoever. It responds to more than 50 voice commands, and eat “food” from your smartphone or tablet via Bluetooth. The prospect of a portable pooch with all the loveable personality of an actual hound without all of the ‘organic’ inconvenience of actually owning an animal appeals to many. The dog also has a guard dog feature, meaning you can leave it to defend your wallet and it will bark if someone tries to take it. Along with the functions there’s a Tamagotchi-esque device that transfers the dog’s information to the mobile device and back again when getting home, along with punishing bad behavior and rewarding it with digital treats which will create different “personalities” over time. The Tamagotchi allows digital animals to be bred and grown over time in a similar manner. It sounds like a figment of fiction but let me assure you it is definitely true. We have move on the platform of artificial intelligence where it has become possible to transfer a bit of human mind, and in this case dog- like characteristics into a bot and get the expected results. It will learn to change its behaviour over time, and touch sensitive areas on its head and back allow you to stroke it, and for the robot to respond. It can also interact with other i-SODOGs via a sensor in its nose. In a neat twist, you’ll be able to ‘upload’ the dog to your phone, so you can take it to work and pet it while leaving its frozen, soulless robotic body at home.